Sally Rosen Kindred has a gift for creating poems I wish I'd written. Here is a garden of witness, of forgetting, of memory and music and love's bright blare. Aster as metaphor, aster as ghost--bouquets of common weeds and wildflowers haunt us in these poems, and teach us to lean toward their mysterious light, to blossom with their stories, and to grow--bruised, but fed by their songs. The linguistic blooms in Book of Asters are like the breathtaking visual turns in a kaleidoscope--dazzling, unexpected, unnerving. Sally Rosen Kindred is the kind of poet Shelley meant when he called poets the unacknowledged legislators of the world. A language this lush and an imagination this inventive can remake us as surely as Kindred's narrators are remade, joy by joy, grief by grief. Kindred is a poet willing to follow her muse and name her vision. Poems from the book appear on-line in Quarterly West, Hunger Mountain, Waccamaw, storySouth, and Cave Wall. Book of Asters is also available from Mayapple Press and Amazon. 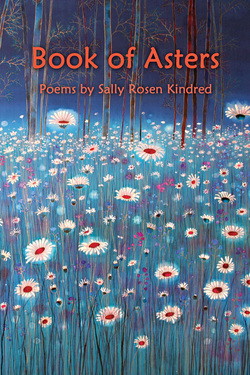 Sally Rosen Kindred cites "star" as the Greek root of "Aster," and these poems themselves are star-flowers. Asters, alders, dandelions, children, animals, a worm, soldiers, other numinous existences,reply with hidden essences to her questing inwardness, as she names them into our recognitions. These poems fuse concepts and sound in a manner now unusual, so that obscured humble things appear nakedly valuable to our eyes and to our spirits. In her wise innocence, the world stands brightly recreated, splendid and difficult and painful to behold,in the noontime sunlight of her craft.